Building trust with the community one cup at a time. In March 2011 the Hawthorne, California, Police Department Community Affairs Unit hosted their first Coffee with a Cop event. Police and community members came together in an informal, neutral space to discuss community issues, build relationships, and drink coffee. Just two years later, Coffee with a Cop events are being hosted in more than 36 states across the nation. Community policing has long been considered a framework for establishing relationships between the community and the police. The importance of trust between officers and residents certainly has not changed. What has dramatically changed, however, is the character and composition of our nation's communities. Shifting demographics, greater mobility with longer commutes to and from work, instantaneous communications, and the advent of web-based social networking have forever altered the very concept of community. With this redefinition, community policing itself must gain a contemporary perspective. So, in this ever-changing world, how can law enforcement personnel engage in quality interactions with the people they serve? Hawthorne Police Department (PD) found one answer to that question, and as Captain Bill Bongle from the Green Bay Police concluded “It is elegant in its simplicity”—just have a cup of coffee. In over 175 communities across the nation, law enforcement agencies are doing just that. Coffee with a Cop is enhancing community trust, increasing police legitimacy, and building partnerships. 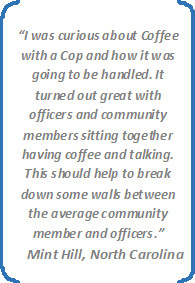 Community members come to their local Coffee with a Cop event for a variety of reasons, but no matter why they come, they are likely to leave with a more positive impression of their local law enforcement officers. The remarkable evolution of Coffee with a Cop can be linked to several factors, but foremost it is due to the vision and funding support of the COPS Office Community Policing Development grant program. Through a strategic partnership between the Hawthorne PD and the University of Illinois' Center for Public Safety and Justice a national training program was established with regional workshops, which began in May of 2013. The regional trainings consist of a half-day interactive workshop taught by veteran officers from Hawthorne PD; Captain Keith Kauffman, Sergeant Chris Cognac, and Detective John Dixon. The workshops are followed by Coffee with a Cop events hosted by local police departments. This allows workshop participants to observe and gain practical hands-on experience to initiate their own Coffee with a Cop events when they return to their jurisdictions. Four regional Coffee with a Cop workshops have been hosted this year: Gulf Shores, Alabama; Evansville and Valparaiso, Indiana; and most recently Green Bay, Wisconsin. One hundred and seventy-three officers have attended the workshops, reaching 105 different law enforcement jurisdictions in 12 different states. The attendants at the regional workshops have not only been local police departments but also state police, Tribal police, conservation officers, university public safety departments, public school resource officers, the Federal Protective Service, and the Veterans Affairs Police. This idea seems to have captured broad interest from many public safety organizations. One more regional workshop will be held in 2013 in New Hampshire and at least five more workshops are planned for 2014. 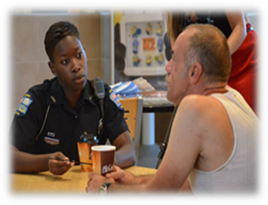 The last regional workshop will be in the Washington, D.C. area, in conjunction with the first ever National Coffee with a Cop Day on August 4, 2014. Social media has also spurred the spread of the initiative, reaching new audiences across the nation at a level that in-person workshops cannot. The Coffee with a Cop Facebook page allows for interagency connection and sharing of information. The page includes advertising of upcoming local events, photos and video from past events, and provides a venue for jurisdictions to showcase their local events. Coffee with a Cop can also be followed on Twitter @coffeewithacop. Additionally, the coffeewithacop.com website provides downloadable resources to law enforcement agencies as they plan their local events. It allows agencies to register local events on an interactive map that community members can view. Community members are encouraged to provide anonymous feedback about their local Coffee with a Cop events. All community comments are forwarded to the local agency's contact person if they have registered their event and provided an e-mail address. To date, 145 Coffee with a Cop events have been registered on coffeewithacop.com. The website has received many feedback comments from community members across the nation, all of which has been positive and insightful. One of the keys to Coffee with a Cop's success is that it removes the physical barriers between officers and residents and happens outside of the crisis situations that routinely define interactions between law enforcement officials and community members. Instead it allows for relaxed, informal one-on-one interactions in a friendly atmosphere. Sergeant Chris Cognac ccognac@cityofhawthorne.org, Detective John Dixon jdixon@cityofhawthorne.org, Captain Keith Kauffman kkauffman@cityofhawthorne.org, or Melissa Bradley Melissa.Bradley@usdoj.gov.